One of Natalie's famous sauces is her "My Sweet Hottie," but don't let the name fool you. "My Sweet Hottie is sometimes assumed or confused to be a 'hot sauce' due to its name, which it is not. It's zesty but MILD to most folks, including kids," she tells us. This, along with all of Natalie's sauces, contains no MSG or High Fructose Corn Syrup. My Sweet Hottie is made from fresh peaches (and lots of them!) right here in Atlanta. We feature My Sweet Hottie in our Beef & Eggplant Stir-fry with Black Rice for a mild bite backed by peach and honey flavors. Read more about Natalie's adventures in Asian-Southern fusion on her blog. If you're an Atlanta local or find yourself in the area this Fall, you can meet Natalie and sample her delicious sauces at the Piedmont Green Market on Saturdays (find PeachDish here, too!) and the Grant Park Farmers Market on Sundays. 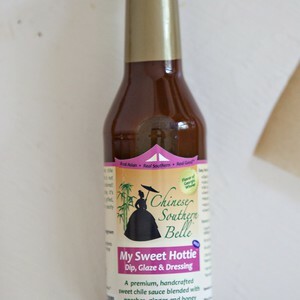 Enjoy 30-75% off Chinese Southern Belle's sauces at her Fall Harvest Sale. You can also attend a Hands-On Chinese Dumplings Cooking Class by Natalie and her mother at the Cook's Warehouse on November 19th. Also, be sure to catch Natalie on upcoming PBS Georgia Traveler show episodes: International Supermarkets, Buford Highway Food Tour, and Cooking Demos (Exotic Fruit Salad, Stir Fry Secrets & Asian Napa Salad)! Ingredients: apple cider vinegar, water, cane sugar, peaches, honey, tomato paste, red chile peppers, orange juice, garlic, sesame oil, food starch, ginger, paprika, salt. Fat Free. Soy Free. Gluten Free. No MSG. No High Fructose Corn Syrup.